Parisians will have a chance to familiarize themselves with Azerbaijani art. 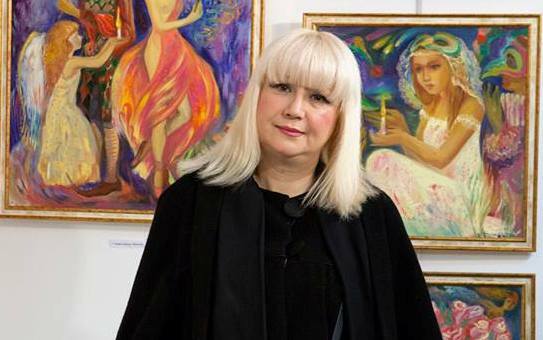 The works of popular Azerbaijani artist Nigar Narimanbayova will be put on display at the 2015 “Salon Business Art” exhibition in France between October 23 and 26. “Salon is a terrific artistic performance center, bringing together French artistic elites and art lovers from around the world every year,” Narimanbayova said. Some 12 paintings by the artist will be featured at the exhibition, including her “Magic of Night,” “Broken wings,” “Soul,” “Nostalgia,” and others. “This is the seventh edition of the salon, and I am participating in it for the third time. My series of works ‘The whole life is theater’ made a strong impression on the organizers of the event, and the picture will once again be represented at the exhibition,” she noted. Narimanbayova also added that as in previous years, the popular Paris art magazine "La Gazette des Arts" will publish an article devoted to her creativity. “Art Salon Business-2015" is held under the patronage of maestro Pierre Cardin, who himself will inaugurate the exhibition. Along with Nigar Narimanbayova, the works of French artists Beatriz Serra, Elana Elena Gubar, Irina Gershevitskaya, and others will be put on display. Narimanbayova, who lives and works in Paris and Baku, graduated from the Azerbaijan State Art School named after Azim Azimzade and the Gerasimov All-Union State Institute of Cinematography in Moscow. Narimanbayova is a member of the Union of Artists of Azerbaijan and the International Association of Art. Her paintings have been put on display at the exhibition halls of the Azerbaijani Culture and Tourism Ministry, Azerbaijan National Museum of Art, as well as in private collections.